I will be a guest at the Bellingham Comicon this coming Saturday, October 24th. A few days ago, I was asked to submit some artwork to publicize the event. 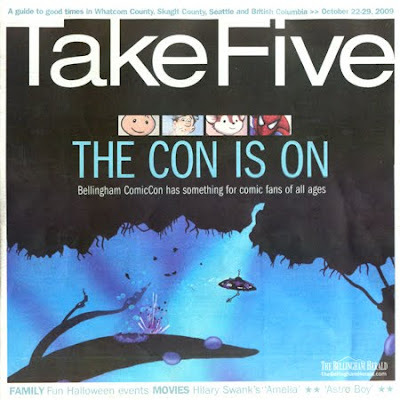 To my surprise and delight, a still of our upcoming videogame was used as the cover of Take Five, the entertainment section of Bellingham's prime newspaper, The Bellingham Herald. If you live in the Pacific Northwest, come on by. I'll be there with books, comics, prints, etc, and will be on hand to answer all the questions you might have about ITSP. Hope to see you there!